So The Grade has been up and running for about three months now, causing some small amount of anguish and/or eye-rolling among education reporters, editors, and observers — along with (I hope) some self-reflection as well. 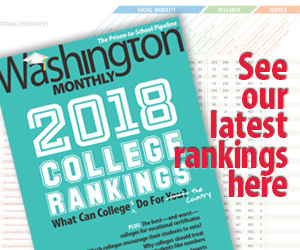 Given the glut of education coverage noted in EdWeek among other places — too much, or not quite enough, depending on whom you talk to — I hope The Grade is useful to those of you who have real lives and want some help winnowing down what to read and figuring out which stories are strong and which aren’t. In addition to this blog page, hosted by The Washington Monthly, there’s also a Twitter feed, an RSS feed (for DIGG, Feedly), and a daily email signup. See a month’s worth of previous entries by clicking the email link. New entries show up first here, then get tweeted out pretty much immediately to the handful of folks who follow The Grade on Twitter. Sometime later, the RSS machine picks up the new content, and then — last but not least — MailChimp sends out an email digest of the day’s posts at about 4pm Eastern. Sometimes, but not always, I’ll share things out via This Week In Education or @alexanderrusso, but it’s not your best bet.